Have you ever left a bad local business review with false information? 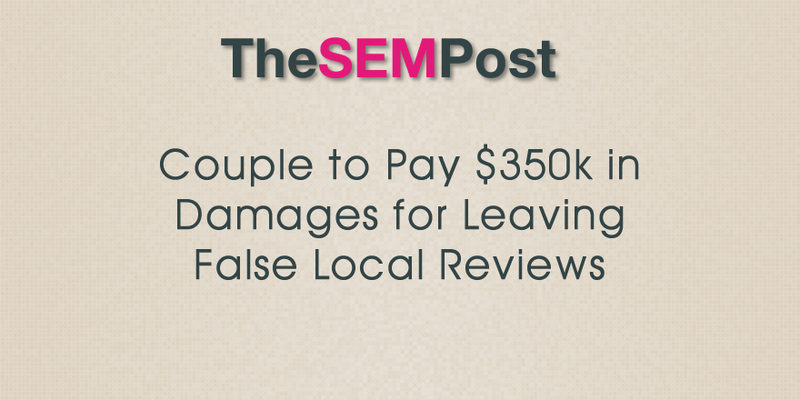 You might want to rethink doing that in the future after a couple was ordered to pay $350,000 over false reviews they left for an attorney. The divorcing couple, Copia Blake and Peter Birzon left reviews that were not only opinion but that crossed the line to libel, as their defamatory reviews accused the wife’s lawyer of not just overcharging for legal fees, but swapping out the original contracts to charge 4 times the agreement’s amount. Both Blake and Birzon admitted to posting the reviews on various internet sites. The evidence showed that Blake had agreed to pay her attorney the amount reflected on the written retainer agreement-$300 an hour. Blake and Birzon both admitted at trial that Giustibelli had not charged Blake four times more than what was quoted in the agreement. The court entered judgment in favor of Giustibelli and awarded punitive damages of $350,000. The legal filing includes multiple reviews left online, here is one of the reviews that the couple jointly left about Blake’s lawyer, Ann-Marie Giustibelli. No integrity. Will say one thing and do another. Her fees outweigh the truth. Altered her charges to 4 times the original quote with no explanation. Do not use her. Don’t mistake sincerity for honesty. In her case, they’re not at all the same. Will literally lie to your face if it means more money for her. Get someone else. . .. Anyone else would do a superior effort for you. I accepted an initial VERY fair offer from my ex. Giustibelli convinced me to “crush” him and that I could have permanent etc. Spent over a year (and 4 times her original estimate) to arrive at the same place we started at. Caused unnecessary chaos and fear with my kids, convinced me that my ex cheated (which he didn’t), that he was hiding money (which he wasn’t), and was mad at ME when I realized her fee circus had gone on long enough and finally said “stop[. ]” Altered her fee structures, actually replaced original documents with others to support her charges and generally gave the kind of poor service you only hear about. I’m not a disgruntled ex-wife. I’m just the foolish person who believes that a person’s word should be backed by integrity. Not even remotely true in this case. I’ve had 2 prior attorneys and never ever have I seen ego and monies be so blatantly out of control. While the couple argued that their reviews were only opinions, the courts did not agree since they accused her lawyer Giustibelli of very specifically charging 4 times the amount, which the couple admitted in court was not true. While so many people hide behind anonymity when writing reviews, this does show that leaving false reviews that cross that line to libel could have serious consequences. The reviews are no longer available online. You can find the full ruling here. Updated: Ars Technica included information in their story that one or more of the reviews were placed on Yelp. Yelp emailed to say the reviews were not placed on their own site.